The Olentangy football team reached the playoffs for the third straight year, continuing a run of five straight winning seasons last fall. So, why did it feel like last season was a letdown? Coach Mark Solis thinks it was leadership. Olentangy dropped four games, one shy of the total amount of losses in coach Mark Solis’ first three seasons. A first-round exit in the Division I, Region 2 playoffs came at the hands of Solis’ former school Lorain. A fumble near the goal line turned into a touchdown, swinging the game 14 points. “I didn’t like how the season ended last year – it left a bad taste in my mouth,” Solis said. Olentangy dropped both district rivalry games, including a 17-14 decision that was its first loss to Olentangy Orange since 2009. Olentangy has a chance to avenge both losses, hosting the Pioneers Oct. 6 and Olentangy Liberty a week later. Olentangy averaged over 40 points per game in its seven victories, but was held to just 28 points in its four losses, including a pair of shutouts. There was plenty of good that came out of last year. Olentangy rallied for 28 points in the second half to clip Reynoldsburg 52-51 after trailing 51-24 on a rainy Thursday night that saw a couple of lightning delays. “As in life – there’s bad things that happen … how you respond to that is up to you. That has nothing to do with your opponent,” Solis said. The rematch is scheduled for Sept. 8 at Reynoldsburg. There was Zach Slade’s 5-yard touchdown with a minute left at Westerville Central in the final game of the year. Both teams were battling for the final playoff spot, which gave fans an elimination game a week early. The teams meet Oct. 27 to close out the regular season. Solis was giddy when asked about this year’s squad. Most football fans know about the Slade brothers, Zack and Jacob, who each committed to play at Michigan State over the summer. They’ll join Liberty linebacker Edward Warinner, Luke Campbell (former Olentangy offensive tackle) and A.J. Acurri (former Liberty offensive tackle). Clearly Mark Dantonio’s staff knows the Olentangy school district. He cites the emergence of senior Jamir Benton as a pleasant surprise. “Something finally clicked for him mentally … I don’t know what that was, but I like it,” Solis said. Benton gives Solis the luxury of playing Jacob Slade on the interior line at times. “Jacob is probably going to play inside at the next level anyway … so, we’re just going to introduce it to him sooner,” Solis said. Seniors Ziyan Sears and Griffin Smith and juniors Jake Takach and Owen Billman provide depth for the unit. Seniors Xavier Harrison and Justin Stewart return at linebacker. Harrison led the team with 105 total tackles last season. Nick McCafferty (junior) and Michael Carter (senior) will battle for the third spot. “(McCafferty) is one of the hardest hitters we have on the team,” Solis said. Xander Gore (senior) has one cornerback position nailed down while DeAnte Ables (junior) and Trey Simpson (senior) battle it out for the other spot. Braydon Chitty (senior) is back at free safety and Connor Sherry (senior) will play strong safety with Max Walden (junior) providing depth. “We’ve got seven or eight kids (on defense) that have viable varsity experience against, what I thought was a good schedule last year,” Solis said. Riley Bruening (senior) is back with the squad after sitting out last year. He practiced well enough to supplant last year’s starting quarterback Connor Haag (junior) … at least for Week 1. Solis noted that Haag will play, however. Trent Maddox (sophomore) provides depth at quarterback. Anthony Golden rushed for 1,975 yards in 2014 and Cam Kennedy followed with 1,000 yards in 2015. Olentangy didn’t have that luxury last season. It did have three different players rush for more than 500 yards, and two of them are back. Ali Iverson (senior) rushed for 563 yards, barely out-paced by Jaden Konadu (junior) at 568 yards last season. Both are back and expected to get the bulk of the carries, though Bruening offers prowess in the rushing game as well. “Ali Iverson is healthy and that’s huge,” Solis said. “Ali wasn’t healthy at any point last year. He looks fluid … he looks explosive. We’re expecting big things from him. Zack Slade led the team in rushing touchdowns last year and will see time in the backfield again. Olentangy has depth at receiver and tight end as well. Juniors Caden Kaiser, Luke Reidel and Ian Drummond should lead the way and Tyler Karbler (senior) and Jace Middleton (freshman) add depth. Nathan Murphy (senior/right guard), Ethan Gates (senior/left guard), McCauley (right tackle), Jacob Slade (left tackle) and Zack Martin (junior/center) along with Noah Dursik (sophomore) are slated to see time on the offensive line. On special teams, James Rosenberry (senior) is committed to play at Maryland as a preferred walk-on. He’s back as long-snapper. Josh Pettrone returns as well and will kick and punt. Olentangy features the same schedule as last year with the sites reversed. Hilliard Darby (Aug. 25) and Dublin Coffman (Sept. 15), which won last year’s meeting 35-0, highlight the non-league home slate. Olentangy travels to Grove City (Sept. 1) and Marysville (Sept. 22) after winning against each last season. Olentangy visits Westerville South (Sept. 29) and Westerville North (Oct. 20) in OCC-Buckeye action. Like the Reynoldsburg game last year, Solis believes the success of this team will be based on how the players respond to adversity. 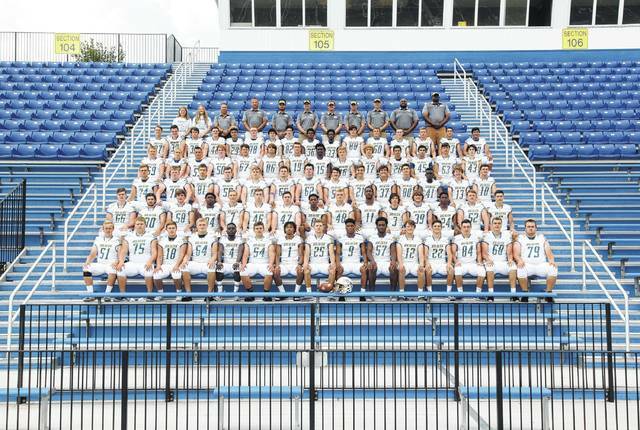 The 2017 Olentangy varsity football team.